The below AP Story about the relationship between fitness and Alzheimer’s disease has an interesting personal relevancy for me. Last Saturday, I ran in a race with a very mentally sharp older individual, who has no hint of senility. This individual was 90 years old. This individual was my father, Gordon S. Johnson, Sr. of Winter Haven, Florida. I often have said about my father that he is the “world champion 80-year-old”, substituting whatever age he was at the time. That reference was not just to his running, but also to his mental health and agility. He worked as an engineer well into his 80’s. 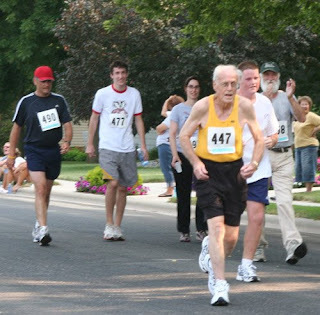 On his 80th birthday, he ran a 10K in something under 54 minutes. The thesis behind the study discussed below is that there is a direct correlation between the volume of any portion of the brain, and the number of functioning brain cells. Neuroradiologists have been opining for years that atrophy in the brain can be correlated, not just to Alzheimer’s, but also to brain damage. We have known for decades that exercise clearly reduces the risk of vascular dementia. What this study contributes to that body of research is that exercise seems to lessen the impact of Alzheimer’s. Traditionally, it was thought that exercise was primarily beneficial to the cardiovascular system. The evidence is mounting that it can have an equally important impact on our mental capacities. I think I had best keep exercising. NEW YORK (AP) _ Patients in the early stages of Alzheimer’s disease who performed better on a treadmill test had less atrophy in the areas of the brain that control memory, according to a study released Sunday. Magnetic resonance imaging (MRI) showed less shrinkage in the hippocampus region of patients’ brains in the Alzheimer’s patients with higher fitness scores. In Alzheimer’s the hippocampus is one of the first parts of the brain to suffer damage. Exercise and physical fitness have been shown to slow age-related brain cell death in healthy older adults. The new study was released at the International Conference on Alzheimer’s Disease in Chicago. Researchers at the University of Kansas Medical Center in Kansas City, Kan., studied the connection between cardiorespiratory fitness and regional brain volume in more than 100 people over 60. About half were healthy older adults and half were in the early stages of Alzheimer’s. But it isn’t clear whether exercise helped avoid brain damage or if brain-damaged people had less ability to exercise.